Anna: Sandro...A month is too long a time. I had grown used to being alone. Sandro: It's the usual uneasiness. Then you'll get over it. Anna: I felt it a little more this time. Sandro: It'll take a little more to go away, then. When L'Avventura premiered at Cannes, it was booed and jeered at by unsympathetic audiences who didn't understand Antonioni's vision. The next day Antonioni received a letter which said, "Aware of the exceptional importance of Michelangelo Antonioni's film, L'Avventura, and appalled by the displays of hostility it has aroused, the undersigned critics and members of the profession are anxious to express their admiration for the maker of this film." It was signed by several distinguished cinematic figures. 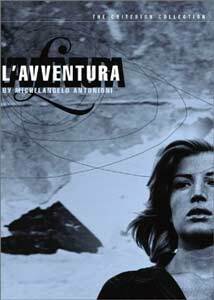 I think it is a testament to Antonioni's genius that L'Avventura gets such mixed reactions today. While critically acknowledged as a masterpiece and a building block of cinema, more casual filmgoers routinely call it long, boring, pretentious, and a series of landscape shots populated with actors. Of course in many ways that is the point. L'Avventura is a film where not much happens, but a lot occurs (compare this to Cléo From 5 to 7, where a lot of things happen, but nothing much occurs). A treasure trove of emotions and stories lies beneath the surface story, but so many people get lost that it's often hard to find the film's center. The story revolves around the idle Italian upper class. Anna (Lea Massari) goes on a yachting trip with her boyfriend Sandro (Gabrielle Ferzetti) and her best friend Claudia (Monica Vitti), among others. On the trip, Anna exhibits odd behavior, and when the party visits an island, she disappears without a trace. Sandro and Claudia begin searching around Italy for her. In the course of their travels, Claudia and Sandro begin an affair, which complicates their lives and the search for Anna. As I mentioned earlier, the surface story seems brief, even boring. Certainly not interesting enough for the movie to be over two hours and twenty minutes in length. But the secret to L'Avventura is to look beyond what you see initially. Antonioni is in a way training us to be less blind to the things around us, by making L'Avventura a highly visual film. Aside from the majestic landscapes, the film's imagery is more often than not a clue as to what is really happening in the story. Characters going through transitions often pass under arches or through doorways. One particularly telling image is a shot of the people from the yacht out swimming near a cluster of islands; as they float among these islands, it becomes obvious that each person is as separated from one another as each island is separated from any larger land mass. The film is littered with so many shots of that type that it is necessary to view it repeatedly in order to discover all the nuances in framing and composition. At a certain point you begin to wonder what in the shot is meant to be there for a reason and what simply happened to be at the location. The large, expansive landscape shots also serve to reinforce the feeling of emptiness and solitude felt by the characters. Antonioni isolates his characters to a degree that is probably unmatched in all of cinema either before or since. In one early scene, Anna and Sandro are making love, and the look of disgust on Anna's face is quite obvious, but Sandro, lost in the throes of ecstasy, does not notice. Claudia is just as blind. She berates Anna about Sandro early on in the picture, saying that Sandro is a no-good scoundrel. Later Claudia falls in love with him, fully expecting him to treat her in a way he never treated Anna, that is, lovingly. The supporting characters come off no better. One woman complains about having to be around people in a party, but goes anyway. Another woman has a relationship with her husband that consists of her husband criticizing everything she says. In return she has meaningless flings with men, but leaves them as soon as her husband calls her to dinner. In the end it seems that only Anna and Claudia ever expressed any misgivings about their way of life. Anna's response is to escape, while Claudia eventually turns a blind eye to it. Despite playing such empty characters, all the actors do a fine job. Monica Vitti in particular does a spectacular job as Claudia. At no point in this film did I think I was watching Monica Vitti, she completely engrossed herself in her part to the point where I accepted without hesitation that I was watching Claudia on the screen. Lea Massari also gives a memorable performance as Anna, even if the structure of the film means we've all but forgotten about her character by the end. Ferzetti is wonderful at putting down most of his emotions, and acting suave for most of the film, although it's subtly made clear that he's perturbed by the events occurring around him. More than anything, L'Avventura is a movie that makes you pay attention and think. Subtlety contrasts with the glaringly obvious, and the film dares you to apply its observations to your own life. How many of us have found ourselves in a relationship without fully knowing how we got into it, and whether or not we want to stay in it? L'Avventura touches on this subject and many others. Image Transfer Review: Having undergone extensive restoration for this DVD release, L'Avventura looks mostly stunning in this new anamorphic transfer. When the film looks good, it looks good: the landscapes come across as crystal clear, while the transfer on the whole is highly detailed, with fine shades of gray. There are still problems with the print, though. Occasional specks, scratches, and dust show up. While the most drastic of these have been removed, it can sometimes be distracting. Some long exterior shots show signs of extreme deterioration, although thankfully those shots are few and far between. The transfer is free of artifacts or edge enhancement. Overall, this is the best L'Avventura has looked in a long time, and will probably be the best it looks for a long time to come. Audio Transfer Review: Criterion presents L'Avventura with a very good mono mix; for mono, this is basically as good as it gets. Everything comes through clearly, with no distortion, and no drowned-out dialogue or sound effects. All things considered, L'Avventura has a pretty rich soundtrack, and it comes across very well. While I would have liked to hear a 5.1 mix (this movie, with scenes on the ocean, on busy city streets, and on trains, lends itself to a 5.1 mix better than one might think), this gives us the best possible sound for the least amount of speakers. Extras Review: Befitting its cinematic importance, Criterion present L'Avventura in a two-disc special edition set. Disc One contains the movie, along with a useless commentary by film historian Gene Youngblood. Youngblood talks about the film on such a rudimentary level that it almost feels offensive. Considering the visual nature of the film, if you look beneath its surface at all, you will see enough of what Antonioni is trying to say that. The only reason to listen to this commentary would be if you weren't inclined to look at anything but, say, the plot—in which case, you won't finish the film, let alone get to the commentary. Better to listen to what Antonioni had to say about it. And this is why Criterion has included various writings by Antonioni, as read by Jack Nicholson, who starred in Antonioni's The Passenger. Nicholson reads the writings in such a way that they remain interesting for the duration. Nicholson also provides personal recollections of Antonioni that are almost alone worth the price of the set. Surprisingly, Nicholson's recollections give more insight into Antonioni than the hour-long documentary in the set, Antonioni: Documents and Testimonials. This essentially follows Antonioni's career trajectory from his early documentary shorts through La Notte. Along the way, we see interviews with various people who worked with Antonioni, including Frederico Fellini. The highlight here is an interview with an author who has hundreds of self-portraits by various famous personages, and he's telling his interviewers about how he will soon be getting Antonioni's self-portrait. However, we only see two or three shots of the director in the whole documentary. For all this piece really shows us about the making of his films, it is about as useful as looking at www.allmovie.com and seeing a list, with reviews. Also on the disc is a restoration demonstration that shows just how much work the film needed, and made me appreciate the wonderful transfer even more. In addition, we get the original theatrical trailer, anamorphic but unremastered, and this made me appreciate the restoration even more than the demonstration did. In the booklet that comes with the set, we get "Cannes Statement" by Antonioni (which is actually an excerpt from one of the writings that Nicholson reads on the disc), an essay by Geoffrey Nowell-Smith, and a copy of the letter that I quoted at the beginning of the review. This is one of the better accompanying booklets I've seen in a Criterion DVD. Hopefully this will be the precedent for future Criterion booklets. L'Avventura is not for everyone. The film will challenge your perceptions of cinema as well as the perceptions of your life. The movie is one of the more challenging films ever made, but because of that it is also one of the most rewarding. For this, I too would like to express my admiration for the maker of this film.